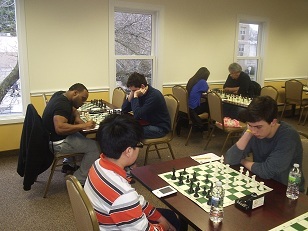 The return of our Winter Quads to Saturdays drew out some of the strongest local players. The top quad featured three masters and strong Expert Kapil Chandran, who no doubt will soon be in this category as well. Dan Lowinger, Ian Harris, and Oliver Chernin joined Kapil for the exciting three round showdown. After a miracle escape from Chernin in round 2, Lowinger recovered to take first place with a nearly perfect 2.5. Chandran put in a solid performance and finished in second place with 1.5. Harris and Chernin tied for third place with 1. Meanwhile six players: Daniel Nussbaum, Ethan Segall, Matthew Chan, Alexandra Wiener, Raffaello Piccoli, and Maurice Rosado played in a Swiss. Rosado's recent streak ended against this tough field. Nussbaum won the section with 2.5 points, but it was Matthew Chan who stole the show. Chan went undefeated, drawing with both Nussbaum and Segall, and winning against Rosado to pick up over 40 points and cross the 1600 mark! Wow! The club will be hosting another quads this Saturday. Join us!